1.) Large Dolch Primer Sight Word Cards. Use for various activities or in a pocket chart. 2.) Graphing Dolch Primer Sight Words Set—Student cuts out sight words and glue to the graph. Last they count up how much they have of each word and write it on the sheet. A little math fun with sight word practice. 10 pages of activities.—Dinosaur Theme. 3.) Crunch Dolch Primer Sight Word Game—Student draws a card and reads it. If they draw a “CRUNCH” card, they must put a;; their pieces back in the container. When time is up the winner is the one with the most popcorn. 4.) DINO Primer sight word dice game. Student rolls the dice and follows the directions on the playing card. When time is up, players count their cards to see who has the most. 5.) 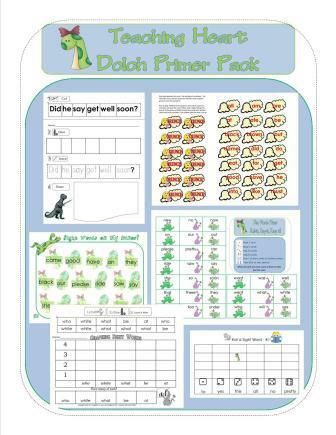 Cut, Glue, Trace, and Draw Dolch Primer Sight Word Activity Sheets— 11 pages Dinosaur Themed. 7.) Crack the Code Activities—8 pages of activities(Dinosaur Themed) . 8.) Cover Up—3 cover-up mats with a Dinosaur theme featuring the Dolch Primer Words. Printable games and activities to review the DOLCH Primer Sight Words. Great for review at school or at home!